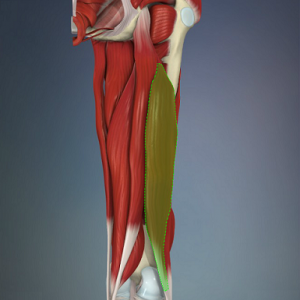 Biceps femoris is a muscle of the posterior compartment of the thigh, and lies in the posterolateral aspect. It arises proximally by two 'heads', termed the 'long head' (superficial) and the 'short head' (deep). 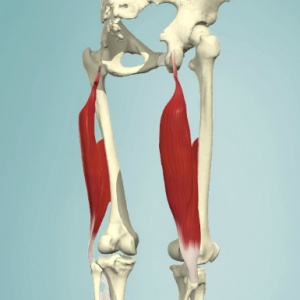 It is part of the hamstrings. 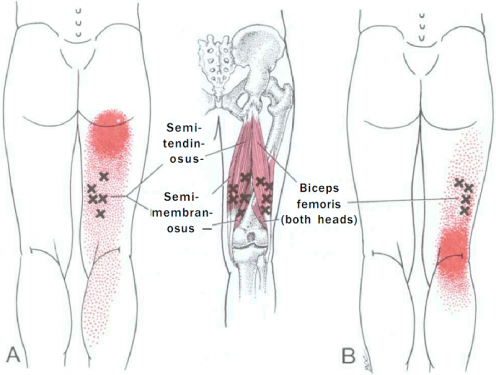 Pain referred from TrPs in the lower half of the biceps femoris (long or short head) focuses on the back of the knee and may extend up the posterolateral area of the thigh as far as the crease of the buttock. ↑ 3.0 3.1 3.2 3.3 3.4 3.5 3.6 3.7 Netter FH (2014). Atlas of Human Anatomy (6th ed). Philadelphia, PA: Saunders-Elsevier. ↑ Sanzo P, MacHutchon M (2015). Length Tension Testing Book 1, Lower Quadrant: A Workbook of Manual Therapy Techniques (2nd ed). Canada: Brush Education. ↑ Travell JG, Simons DG, Simons LS (1998). Travell and Simons' Myofascial Pain and Dysfunction: The Trigger Point Manual, Volume 1: The Lower Extremities (2nd ed). Baltimore, MD: Williams & Wilkins.